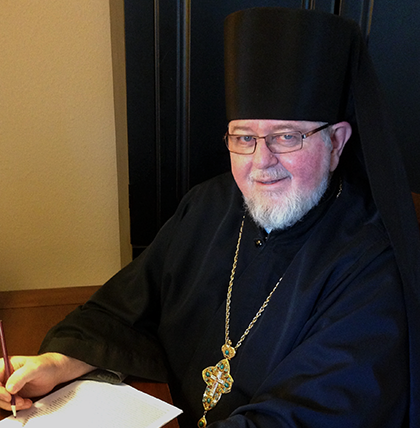 Archimandrite David [Mahaffey] was elected by the members of the Holy Synod of Bishops of the Orthodox Church in America to fill the vacant Episcopal See of Sitka and Alaska on Oct. 16, 2013. The election took place during the fall session of the Holy Synod at the OCA Chancery. Delegates to the Assembly of the Diocese of Alaska, on Sept. 15, 2012, had nominated Father David, who has been serving as the diocese’s Administrator and Chancellor, to fill the vacant See. His Eminence, Archbishop Benjamin, Locum Tenens of Episcopal See of Sitka and Alaska, presented his name to the Holy Synod for canonical election. Born in Altoona, Penn., in 1952, Father David was received into the Orthodox Christian faith in 1975, two years after his marriage to the late Karen Meterko. He received his Master of Divinity degree from Saint Tikhon’s Seminary, South Canaan, Penn., in 1997. In 2003, he graduated from the University of Scranton with bachelor’s degrees in theology and philosophy. Two years later, he received his master of arts degree in theology from the same school. He was ordained to the diaconate in 1981 and served throughout the Diocese of Pittsburgh and Western Pennsylvania. After his ordination to the priesthood in 1993, he served as rector of Saint Michael Church in Old Forge, Penn., until 2006, when he assumed the pastorate of Holy Trinity Church, Pottstown, Penn., In 2009, he was assigned rector of Saint Nicholas Church in Bethlehem, Penn. He and his wife, who died in 2007, raised four children. Father David served as a graduate assistant in the Theology Department of the University of Scranton, adjunct lecturer at Saint Tikhon’s Seminary and adjunct lecturer in theology and philosophy at Alvernia University, Melrose Park Campus in Philadelphia. He has served in a wide variety of capacities in the Diocese of Philadelphia and Eastern Pennsylvania, including dean of the Philadelphia Deanery. The dates of Father David’s consecration to the episcopacy are Feb. 20 and 21at St. Innocent Cathedral in Anchorage. His installation will take place on Feb. 23, at St. Michael Cathedral in Sitka.